Model talk on life in New York, the Pinay edge in the international modeling scene, wardrobe malfunctions, and more. Before a Filipina finally became a Ford Supermodel of the World, two teenagers hailing from Laguna helped pave the way for her, and many more aspiring Pinays about to come in their stead. In the years before Danica Magpantay would finally cinch the Ford Supermodel of the World title in 2011, fellow Pinays Charlene "Chat" Almarvez and Charo Ronquillo came very close: Almarvez was named first runner-up in 2009 and won a $150,000 modelling contract, while Ronquillo was second runner-up in 2005 and got a $100,000 contract. 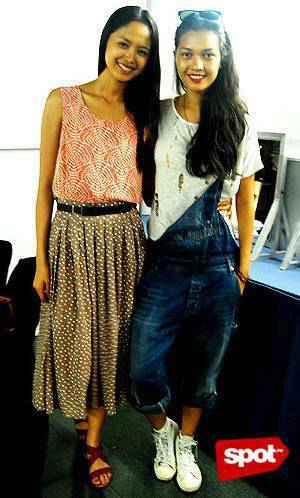 Now both based in New York City, carving a niche for themselves in the fashion industry with modeling coup after coup. Almarvez leans toward high-fashion editorials while Ronquillo, described by Bill Ford as having "that unique look from the Philippines," is a familiar face in commercial print. Almarvez, 18 has graced the pages of Town and Country, Glamour, V and Teen Vogue, while Ronquillo, now 23, has appeared in Marie Claire, Glamour, Neon and Seventeen, among other magazines, and has flown to Paris, Spain and Argentina for work. The former has landed a Nordstrom campaign while Ronquillo has appeared in ads for Macy’s, Old Navy and Sak’s Fifth Avenue among others. Both have become New York Fashion Week fixtures: Ronquillo has walked the runways for Nanette Lapore, Tory Burch, Antonio Berardi, Kenneth Cole, BCBG, Sisley and Benetton; Almarvez for Diane von Furstenberg, Peter Som, Cynthia Steffe, Wayne Lee, Rachel Comey and Lacoste. SPOT.ph caught up with the models for an exclusive interview when they were in town for Philippine Fashion Week last week. Backstage at the rehearsals for a show smack in the middle of SM Mall of Asia, and between mad dashes to the runway seconds before they were up, the two friends talked about how their new world has changed them, what’s next after modeling, and more. Charlene "Chat" Almarvez, 2009 Ford Supermodel of the World first runner-up. Click for more photos. 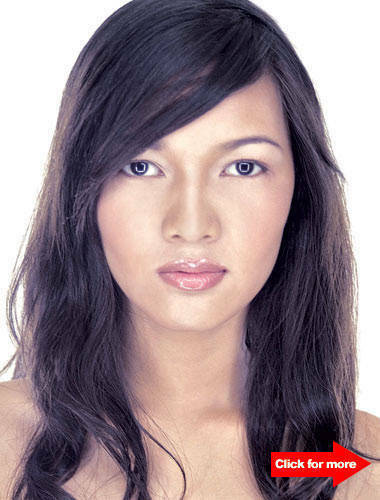 How has your Filipino look been described by casting agents and fellow models in New York? Ronquillo: They just love our skin. [They say that] it’s, like, glowing. They love our tan, our bright complexion, our hair. Almarvez: They love our facial features ’cause [our looks are all] mixed [up]. They can't tell whether we’re Chinese, Japanese or Brazilian. They love it. How have you been booked for your magazine editorials? Almarvez: I go to castings for some magazines while others already know me and book me for shoot. Ronquillo: For me, it was easy because there weren’t a lot of Asians in New York no’ng na-book ko ’yan, so ’di ganoon kalakas ’yong competition. Kinukuha nila ’yong unique faces, ’yong Filipina faces. Do you still go to castings all the time or are you already known in the industry? Ronquillo: It's a mix. Sometimes, if it's new client, then you have to go to a casting. If they like you, (you move on to) the second casting. If you’ve worked with them before, they recognize you. Can you name a few clients who already know you for your look? Ronquillo: Glamour has booked me a couple of times. Marie Claire, twice. Also catalogs like Macy’s, Nordstrom and Target. Almarvez: I’m a fitting model for Vera Wang. Sometimes, I also do shoots for Nordstrom and Target. Charo Ronquillo, 2005 Ford Supermodel of the World second runner-up. Click for more photos. Describe your New York Fashion Week experience, your first one for instance. Almarvez: Masaya pero talagang nakakapagod, kasi siyempre ’di mo pa alam ’yong lugar. May map ka, tapos dapat on time ka. Sa isang araw may 10-plus castings ka sa iba't ibang lugar. During the shows, have you experienced wardrobe malfunctions? Almarvez: Too big or too small. We just stuff them with tissue. Ronquillo: Just wear them anyway. And walk. 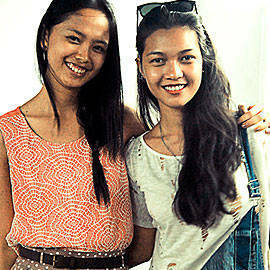 Danica Magpantay said she got free shoes during her first Fashion Week. How about you, what kinds of perks or freebies have you gotten? Almarvez: Clothes from brands like Jose Duran and Nanette Lepore. Ronquillo: I got clothes from Nanette Lepore before, and jewels and stuff from Tory Burch. What is the difference between the Philippine style of modeling and the New York style? Almarvez: I think there's no big difference. Almarvez: A lot? (laughs) Maybe the way they value time... (The pace is faster) there. Ronquillo: In New York, if it's work, then it's work. Kasi here, it’s fun and playful. Everybody's, like, talking to each other. In New York, it's so professional. They just ask, "How are you?" and that's it. Almarvez: We say "Hi" and "Thank you." Did you have to change your runway walk? Almarvez: They don’t like it when you cross your legs. Ronquillo: There are no rehearsals in New York. Here, there’s a bit of choreography. In New York, it’s just back and forth. It’s simpler. Which supermodels have you worked with in New York? Ronquillo: Chanel (Iman). She was my batchmate in (the 2005) Ford Supermodel of the World (contest). Who else? Daria Werbowy. Almarvez: When I did "Fashion Night Out," I saw Gisele Bündchen and Chanel Iman. Aside from the U.S. and the Philippines, what other countries have you worked in? Ronquillo: I’ve worked in Spain-in Madrid and Barcelona-and Argentina. Loved it. Argentina is kind of more like the Philippines (in terms of) the vibe (and) the people. The same with Spain. [Being there] brought me back home. The Spanish food is so nice. Plus, the siesta! Why do you think the younger batch of models is braver and more adventurous in pursuing a career abroad? What do you think is the difference then and now? Almarvez: We have a good agency. Ronquillo: Other than having a good agency, young aspiring models have to be aware of human trafficking. We're doing a campaign against human trafficking with Katie Ford (former Ford Models CEO)... screened during Philippine Fashion Week. How do you handle rejection? How do you cheer yourself up when it happens? Almarvez: [I just think,] "maybe it’s just not for me. Maybe the look they want is not ’me’." Ronquillo: Yeah, we’ve been trained to handle it. CalCarrie’s and Joey Espino have trained us to accept rejection. It’s not always [going to be] you. If the job is not yours, it’s not yours. Almarvez: It's not that you're not good. It's just that it's not for you. How has life in New York changed you? Ronquillo: You learn how to be independent. We learned to live and have fun by ourselves (because) we don’t have friends and family (there). Almarvez: (We) work as hard as (we) can. How has your fashion sense evolved? How would you describe your style of dressing now? Almarvez: Glamorous. (For me) it depends as well. Sometimes, just shorts and a tank top. Sometimes (I dress) girly. Is it true what they say in America’s Next Top Model that you’re supposed to dress very simply when you go to castings? Ronquillo: They only like black tank tops, solid colors, and leggings or just jeans. Almarvez: No make-up. Bare skin (is better). Almarvez: We go to the park. Ronquillo: We watch a movie. We walk my dog Duenne. He’s so cute. I miss him. 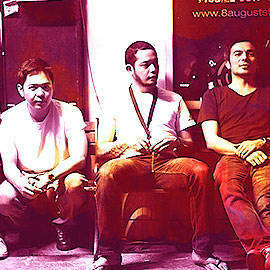 Ronquillo: We dance in the apartment. We often go to the gym because as CalCarrie’s models, we're trained to be in the best shape. Do you have house parties? Where do you go in New York for Filipino food? Ronquillo: Grill 21 and Café 81. We love Filipino food. Almarvez: In Queens, there’s Krystal’s. Tayag. What do you eat now that you didn’t use to before New York? Ronquillo: Before, I didn’t eat sushi. When I got to New York, it was like the models’ favorite so I tried it and now it’s my favorite. Almarvez: I used to not eat raw fish. Now, I do. How do you stay fit? Do you have a particular diet? Almarvez: We go to the gym and eat healthy food like greens and fruits. Ronquillo: (We stay away from) pork and carbs. Ronquillo: Bruce Weber, I've worked with him for JCPenney, Ralph Lauren. I've (also) worked with Walter Chin for Glamour magazine. Almarvez: Ruven Afanador for Town & Country and Richard Burbridge for V magazine. 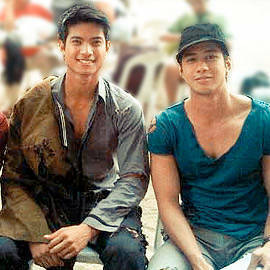 Ronquillo and Almarvez: Doc Marlon Pecjo. Ronquillo: And Dominique James! I love Dominique James. Almarvez: They shot us during the Ford competition. How has your Philippine Fashion Week experience been so far? Ronquillo: At first, it weirded me out when everybody was speaking Tagalog in the airport...When I got here, all the models were excited. Almarvez: It's like a family. Warm. What’s it like modeling Filipiniana couture again? Ronquillo: It feels awesome. It feels like home. It reminds me of my grade school (days), when I had to wear that kind of thing and dance. So we were dancing the tinikling backstage. Almarvez: Alam niya (dapat) ’yong pinasukan niya. Siyempre, you’ll have sacrifices (and) big changes in your life. Ronquillo: You have to be ready. Don't be attached to the idea of being a model. Just be yourself and just do it. If it makes you happy, then pursue it. Do you plan on going back to Manila for good? If yes, when would that happen and why? Almarvez: After modeling, I want to go back to my family and maybe live in the province. Ronquillo: Right now, I don't know. I’m just really focused on modeling. I'm based in New York and I’ve been living there for the past five years. I got my green card so maybe I’ll stay. Maybe I’ll go to Europe. I don’t know yet. Danica Magpantay’s mom Lala Flores, also a Ford Supermodel Philippines winner, is now a renowned makeup artist. Have you thought of what kind of career you’d like to pursue after modeling? Almarvez: I want to learn how to cook. Ronquillo: I want something related to the arts, maybe photography or painting. Do you have mentors that you look up to like Joey Espino of CalCarrie’s? Almarvez: Joey, Audie (Espino), my parents, and (fashion director) Cata Figueroa. Ronquillo: For me, it's really Joey Espino, aside from my family, because he's the one who believed in us (and helped us get to) wherever we are right now. He guides us... from head to toe. He taught us to be faithful in Church. How would you encourage the average Filipina to embrace her dark complexion and Pinay looks? Almarvez: Accept yourself. Sometimes, I don’t like my features but this is me. I can’t hide it. You have to learn to accept yourself and be happy. Videos by Amapola Española, Photo by Jean Natividad.